Suki decided to perch in our red Japanese Maple tree in the front of the house. She's pretty well camouflaged! The tree is not very large and recently was trimmed up, so Suki could be up off the ground and still see what was going on. Millie, our feral ktty, is like all other kitties in that if you put something different down, they have to sit on it. There two oriental runners had gotten wet and we were letting the summer breezes help dry then. 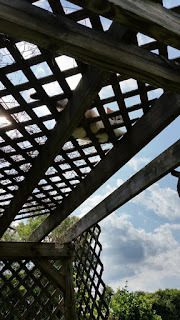 Millie likes to keep track of what we are doing when we're weeding in the perennial garden and has discovered the perfect viewing spot from on top of the pergola. This is Boots, our guest kitty from next door, looking comfortable and enjoying the sunshine. Suki looks like the cheshire cat in that second shot. Disappearing in a cloud of smoke!